Jeffreys Bay is known as the JEWEL on the coast of the Eastern Cape, South Africa. It is truly paradise - unending white sandy beaches with whales and dolphins playing in the warm waves of the Indian Ocean. Property is in abundance & must be the most affordable on the coast of South Africa. Experience stunning weather just about all year round, in this idyllic place of sunshine, aloes, shells, reefs and shopping! The town is bordered on both sides by nature reserves & rivers – the Kabeljous & Seekoei Estuaries & the Noorsekloof nature reserve. Once a sleepy fishing and surfing town, it is now one of the fastest growing coastal towns in South Africa with a buoyant property market. Jeffreys Bay clearly highlights the diversity of the local community - craft industries, surf shops, malls and a variety of coffee shops and restaurants to cater for every culinary taste. Despite this growth, it still retains its unique surfer element, typical of the relaxed and friendly locals. Jeffreys Bay is probably best known worldwide as "THE HOME OF THE PERFECT WAVE". It is acclaimed as being one of the top 10 surf spots in the world and is host to the International Billabong Pro Surfing competition. International surfers flock to catch the legendary waves and are reluctant to leave! Dolphin Beach has recently been awarded the prestigious International Blue Flag status. The legendary waves and great climate made it a popular place for property investors. Jeffreys Bay is situated at the gateway to the beautiful Garden Route - the famous route between Port Elizabeth & Cape Town. From Jeffreys Bay, this scenic road winds through the beautiful Tsitsikamma forest, Nature’s Valley and the seaside towns, Plettenberg Bay & Knysna. This prime position is the ideal base from which to explore the southern most tip of Africa. The ever popular Wavecrest is the largest and main suburb of Jeffreys Bay with shops, restaurants, churches, schools, clinic, sports facilities (golf, tennis, bowls, squash) all in close proximity. The main beaches and world famous surf spots are also in this area. A large variety of property types are available – from sea front mansions to affordable homes, apartments, townhouses as well as a large selection of plots. Most of the properties have sea or kloof views. Properties in Wavecrest range in price from R535 000 to R5.5 million. About 5 km from town is the lovely little village of Aston Bay. It is situated along a magnificent stretch of white pristine beaches and next to the Seekoei River. There is some very affordable property available, most of them within walking distance to the sea. Safe bathing, kayaking, whale and dolphin watching, fishing or just hiking along the 36 km stretch of beach is what living in this area is all about. Properties in Aston Bay range in price from R510 000 to R3.7 million. If you are looking for secure waterside living, the unique Marina Martinique must be your first choice to buy a property. Situated between Aston Bay and the beach this peaceful and safe area (24 hour patrolled security) has 5 km of canals where 300 million litres of seawater are being recycled every 14 days. Residents of this caribbean style up-market homestead properties or the more affordable townhouses have the canals to swim, fish, paddle, sail – an ideal and safe environment for old and young. There are 2 famous sea-food restaurants on the beach within walking distance. 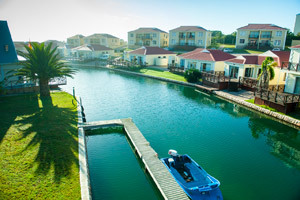 Properties in Marina Martinique range in price from R500 000 to R6.5 million. From Aston Bay across the Seekoei River mouth, about 10 km from central Jeffreys Bay, nestles the quiet, tranquil area of Paradise Beach. Here you will find lush green vegetation, lovely big trees and pristine beaches. Most of the property, some of which are very affordable, is within 600m to the beach. There is also a landing strip for small planes. This is an environment friendly area with many green belt areas where you will still find buck and tons of bird live. Properties in Paradise Beach range in price from R430 000 to R9.6 million.